In what has been an incredible few weeks of tournament action, college basketball will finally crown its new champion this Monday. 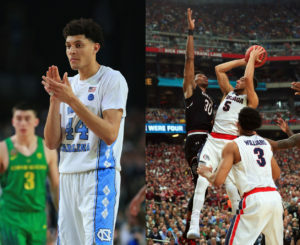 Returning after losing last year’s championship game in devastating fashion, the North Carolina Tar Heels will look to take home the crown as they take on the Gonzaga Bulldogs, who are appearing in their first National Championship game. This will undoubtedly be a great contest between two of college basketball’s best teams to decide who truly is the best team in the country. While many complained that the tournament lacked first round upsets, the following rounds were filled with utter chaos and turmoil and many peoples’ brackets were left in shambles. Fans watched in horror as Villanova was upset by Wisconsin. Then, Duke fell to South Carolina and Louisville fell to Michigan. Bracket busted. The following rounds continued to provide plenty of excitement as South Carolina continued their Cinderella run, winning the East region of the tournament and heading to the Final Four. In the South region, top seed Gonzaga toppled 11 seed Xavier to win the region, while 3 seed Oregon toppled a heavily favored Kansas to take home the Midwest. Finally, 1 seed North Carolina scratched out a hard fought victory over 2 seed Kentucky, in what was an instant classic. With all the chaos and excitement, four teams were left standing: South Carolina, Gonzaga, Oregon, and North Carolina. South Carolina took on Gonzaga in the first game of the Final Four and the clock eventually struck midnight on South Carolina’s run. South Carolina gave Gonzaga all they could handle in a 77-73 thriller that sent the Zags to their first ever National Championship. In the other game, North Carolina held on to defeat Oregon by a score of 77-76, setting up a matchup of two top seeded teams. Although they were both number 1 seeds in their respective regions, Gonzaga has to be considered the underdog coming into this game when going against powerhouse North Carolina. Gonzaga, prior to this season, has never won a National Championship, North Carolina has won 5 including being last year’s runner up. Gonzaga has never made it a Final Four before this season, North Carolina has appeared in 20 Final Fours. Gonzaga plays in the small West Coast Conference while North Carolina plays in the powerhouse Atlantic Coast Conference. The teams could not be more different, but they do share one thing: they both know how to win. North Carolina and Gonzaga both amassed over 30 wins this season and both look to win one more big one Monday night. Both teams are fundamentally sound, have senior leaders, and are ready to make finish off what they started this season. Joel Berry and Justin Jackson will lead the Tar Heels while Nigel Williams-Goss and Przemek Karnowski will lead the Zags as they go to battle for the right to call themselves champions. This game should be must see and will provide a perfect cap to what has been an incredible March Madness.